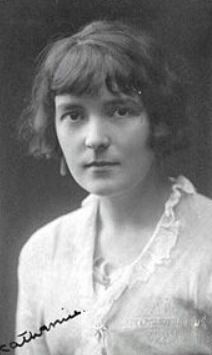 Katherine Mansfield is best known for her short fiction. Born in 1888 in New Zealand, she died young at age 34. During her short life she wrote several volumes of short stories and critical literary essays. A free-spirited Bohemian, her personality as well as her writing, influenced the major writers of her day, including James Joyce and Virginia Wolf. in whose works she appeared as a character. Her short stories are considered painterly. They explore feeling and image as abstractions unhampered by conventional plot elements such as beginning and endings. As such they are open-ended forays into the streaming thoughts of characters pursuing their everyday lives and dealing with their troubles. The following excerpt, taken from the short story “This Flower,” is a perfect example of this. The unnamed character has just received a fatal diagnosis. As she lay there, looking up at the ceiling, she had her moment–yes, she had her moment! And it was not connected to anything she had thought or felt before, not even with those words the doctor had scarcely ceased speaking. It was single, glowing, perfect–it was like a pearl, too flawless to match another…Could she describe what happened? Impossible. It was as though even if she had not been conscious (and she had certainly not been conscious all the time) that she was fighting against the stream of life!–indeed she had suddenly ceased to struggle. Oh, more than that! She had yielded, yielded absolutely, down to every minutest pulse and nerve, and she had fallen into the bright bosom of the stream and it had borne her…She was part of her room–part of the great bouquet of southern anemones, of wet net curtains that blew in stiff against the light breeze, of the mirrors, the white silky rugs; she was part of the high, shaking, quivering clamour, broken with little bells and crying voices that went streaming by outside,–part of the leaves and the light. How many different lives can you imagine for yourself? How many of them have you written? I had a hard time selecting just the right passage. Such incredible imagery. I must have read 20 of her stories before choosing this one. Nice post. Thanks for reminding me about Mansfield. I keep finding all these amazing writers. It has been a wondrous quest keeping up this blog. Thanks for your support.